These pictures were taken in 2008 and were put in a blog when I started blogging in 2012. Obviously, I didn’t post it. Since our winter has been relatively mild, I thought now would be a good time to post it. 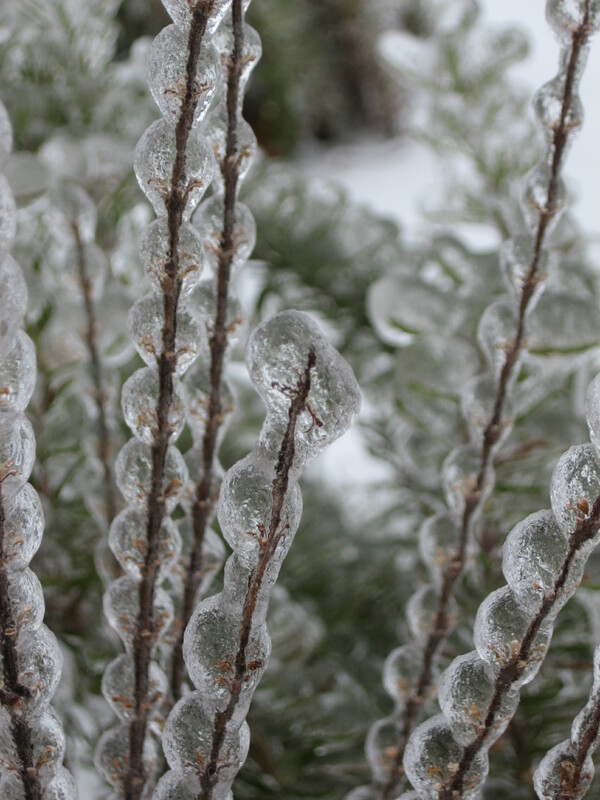 It was a strong snow and ice storm! 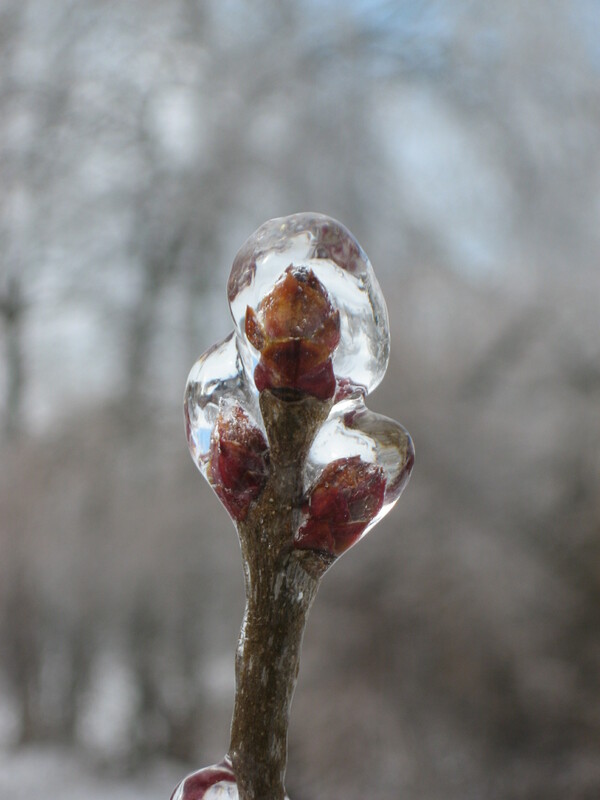 The weather remained frigid and nothing melted. 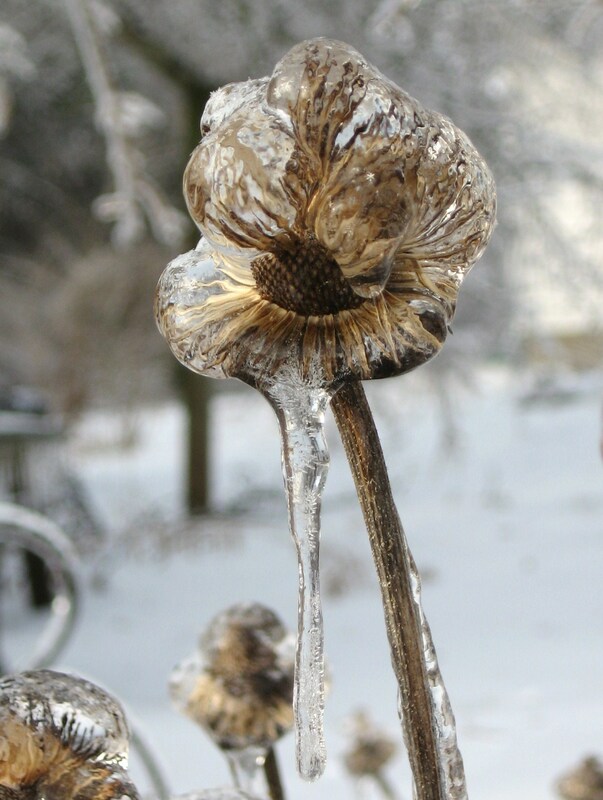 I wish I had an explanation of how the ice formed on this coneflower seedhead. 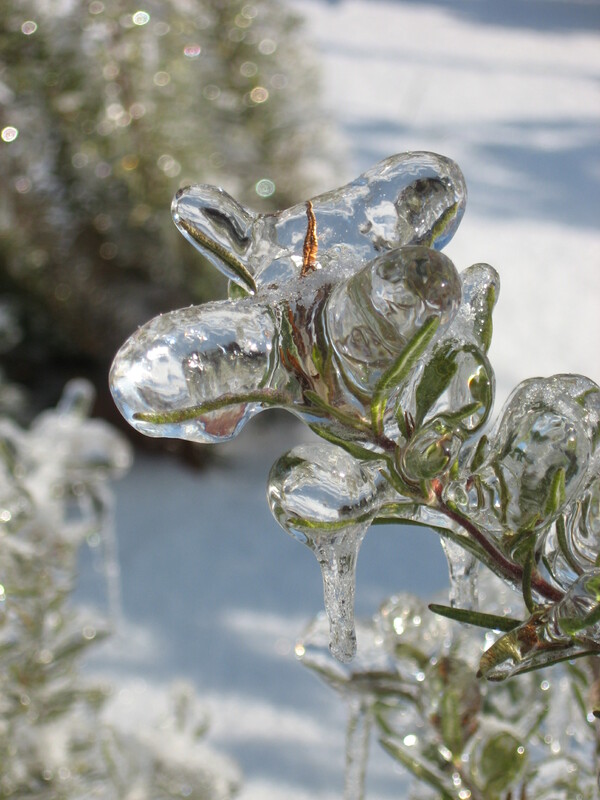 It was surprising that the rosemary could support the weight of the ice. 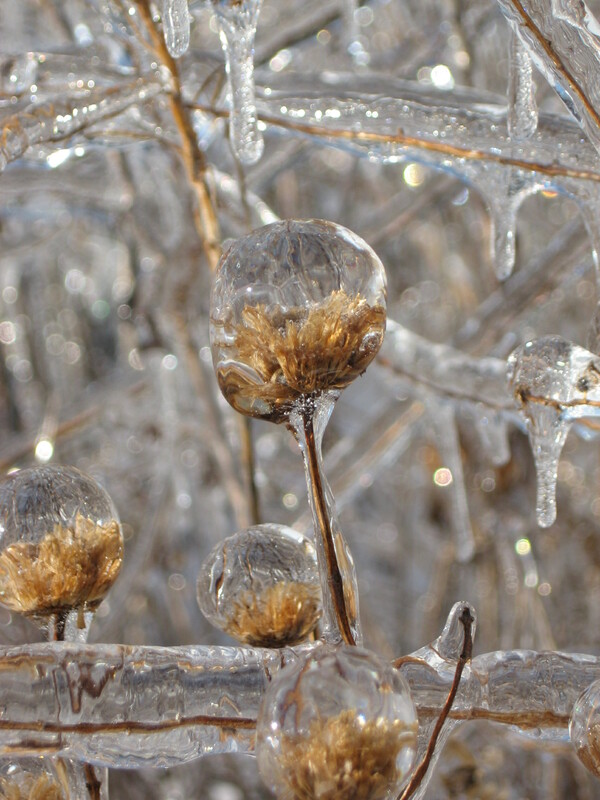 Notice in all the pictures at how the ice inverted all the reflections. The red in the left is an upside down reflection of our barn. I’m not sure what this plant was. It has the snow in the upper part of the reflections and the sky below. 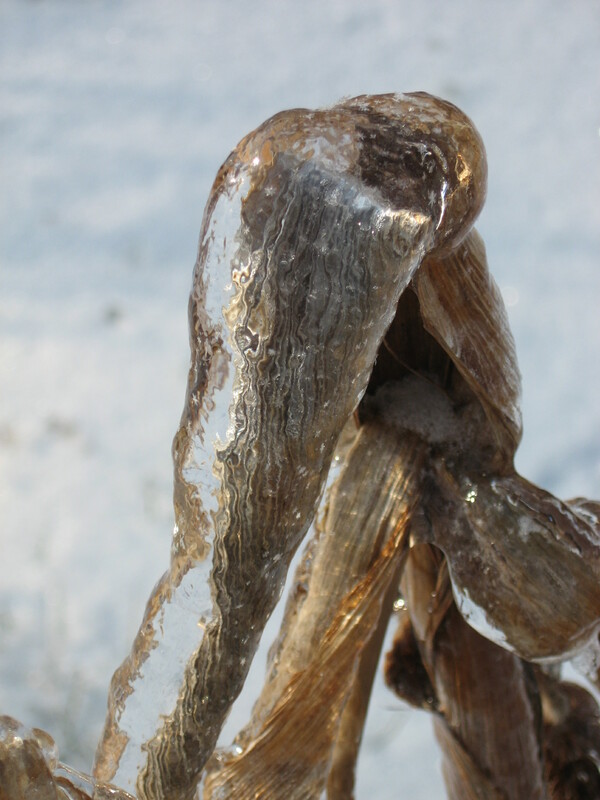 Thin stems reflections turned into wavy lines in the ice. I still don’t have an explanation for the lumpy shapes lining these stems. 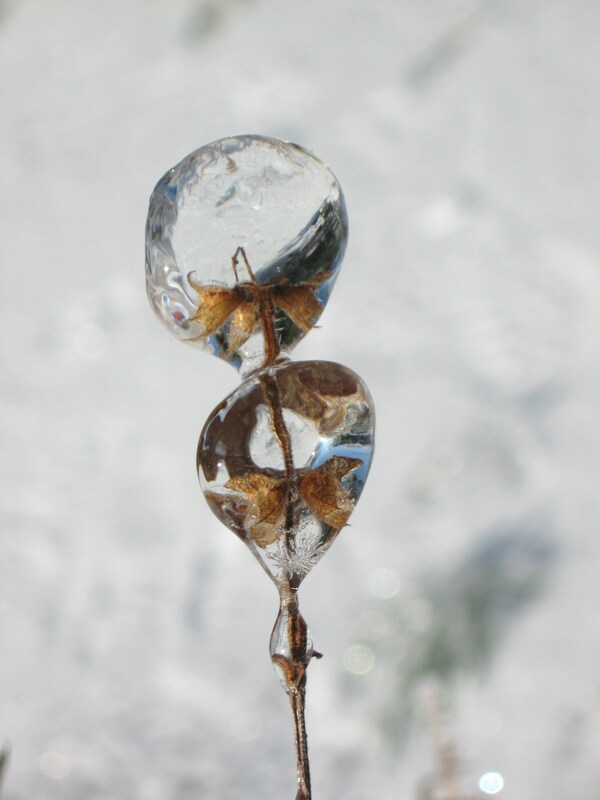 The whole backyard became a crystal showcase. I can’t remember what this was either. It was about waist high and looked similar to corn. 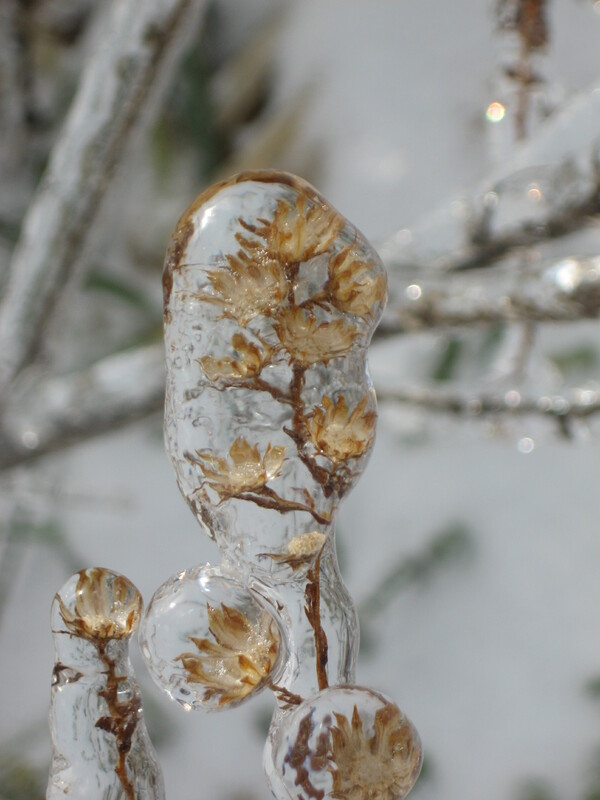 I didn’t see how some of the plants could remain standing with all the weight of the ice. 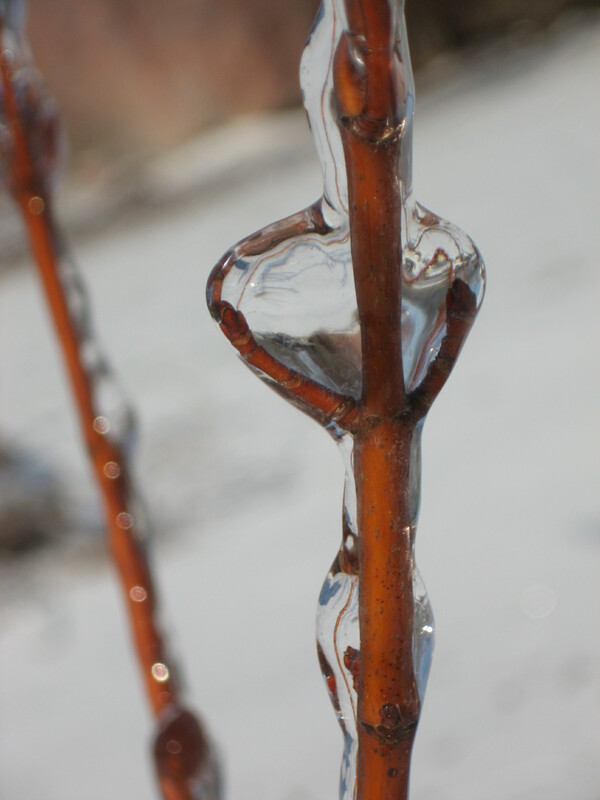 Red maple branches turned the reflections every which way. The duller red in the top is our barn in an upside position. 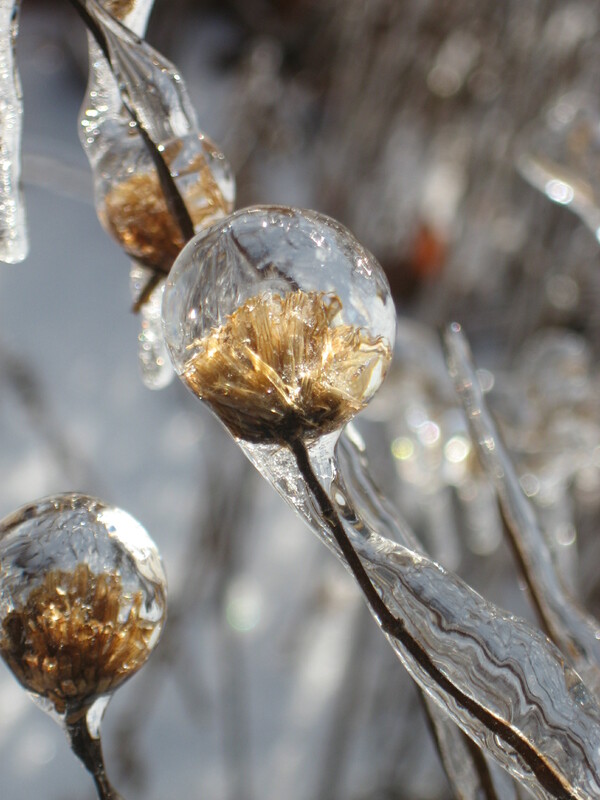 or the aster remnants either. 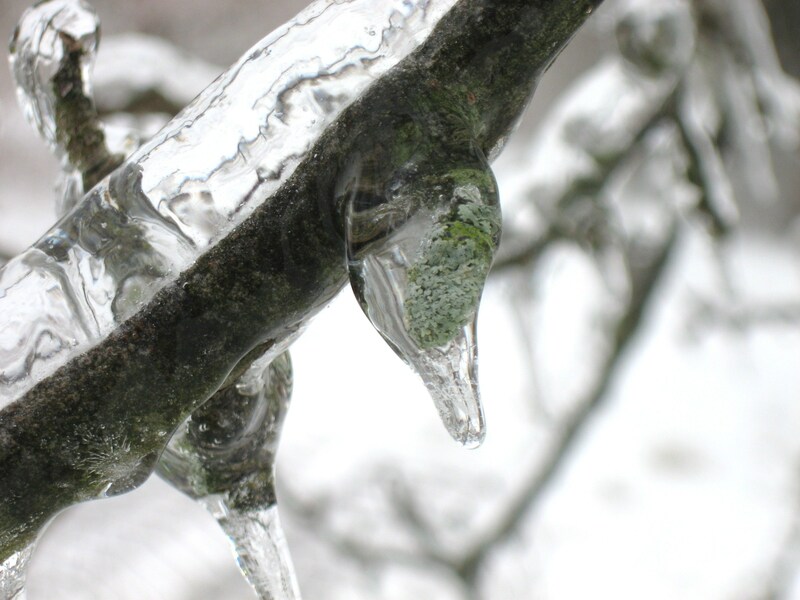 The ice storm was one of those magical times that stays with you for years. 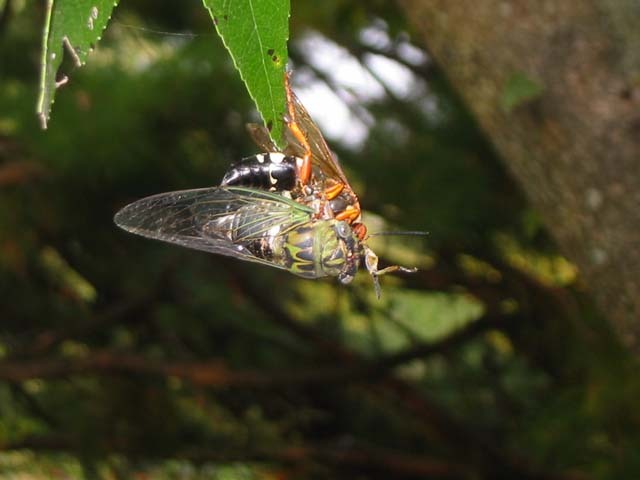 I knew cicada killers nested in my garden, and also knew they paralyzed cicadas to feed their young. 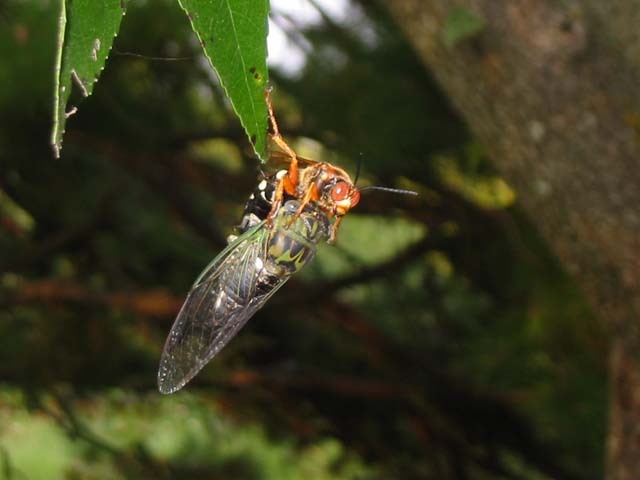 That was basically all I knew about cicadas until camping at my rural property. I sat in camp that evening, facing west. 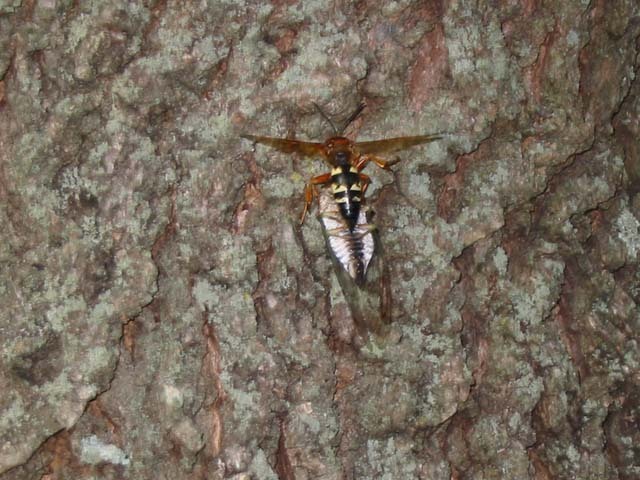 A cicada killer flew from a tree. Its flight angled downward because of the weight of the cicada it was carrying. 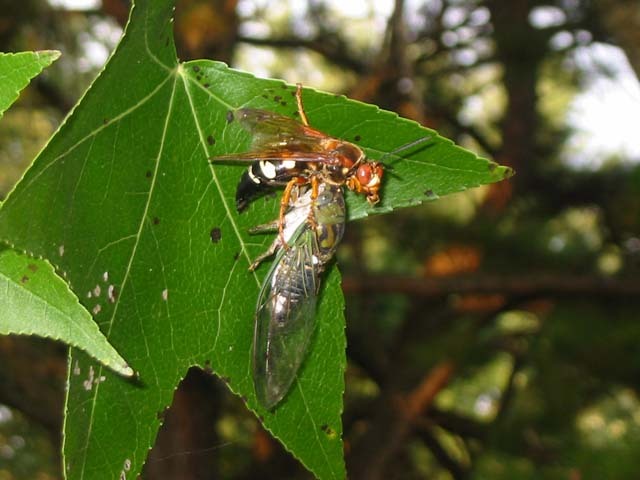 It carried/dragged the cicada a considerable distance to the nearest tree that was inline with the location of its nest. It climbed the tree and flew out toward its nest. I lost sight of it this time because of the thick vegetation. Obviously, watching this made much more of an impression on me than just reading about it in a book would have. My best friend, Therese, went by the eagle nest recently and reported in to me that she’d seen an eagle in the nest. Seems the tree with the nest lost more limbs with a strong storm we recieved from hurricane Sandy. Buffy and I took a drive this morning to check it out. It did look a tad bare. No eagle sat in it or in any of the surrounding trees. Last year I started a series of blogs with weekly trips to the nest. This is an old old picture, with obvious lack of quality. It does show how the tree looked before it lost one whole trunk. Both adults were in the nest January 26. 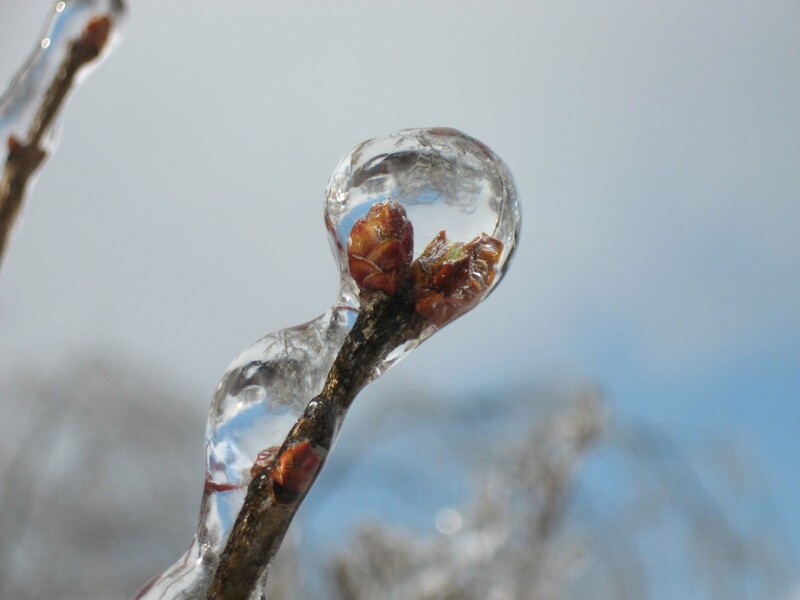 I took this picture on March 27th this year while the tree was still leafing out. This picture was taken the same day. The eagle appeared to be feeding young. The date was April 10. I made 4 trips between April 24 and May 5 without seeing any eagles. I assumed a predator got the young while the adults were away. Eagle facts: average life span up to 28 years in the wild, body size 34 to 43 inches, weight 6 1/2 to 14 pounds and wingspan 6-8 feet. Females are larger than the males. The young are 4-5 years before they have white head and tail. We made a loop around behind an old abandoned mine. A large bird soared around in an area with a large field by the road and the mine off in the distance. It didn’t have white head or tail. It did hold its wings flat — an immature bald eagle. Vultures hold their wings in a vee (dihedral) when soaring. So that’s a good way to tell the difference between the 2 at a distance. I do so hope the tree remains standing, and the eagles successfully raise young next year.